Worried That Your Baby's Sick? 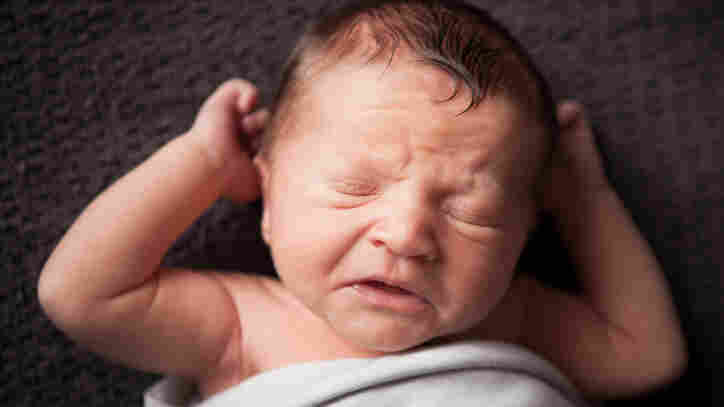 There May Be An Upside : Shots - Health News Parents of new babies know they get sick a lot. That may be because infants deliberately suppress their immune systems so that essential microbes have a chance to settle in. An immune suppression system in the blood of newborn babies could be key to building a healthy microbiome. He's not just getting a cold. He's building his microbiome. Here's possible solace for parents who are up at night with a baby who gets sick all the time: There appears to be a good reason why infant immune systems don't fight off germs. A newborn's immune system is deliberately not doing battle with every germ that comes along so that "good" microbes have a chance to settle in, researchers say. That explanation is at odds with the widely held belief that those new immune systems are just too weak to do the job. Evidence has been mounting that most of the trillions of bacteria, fungi and other microbes that inhabit the human body are actually helpful. They seem to perform crucial functions, such as helping fight off pathogens and teaching our immune systems how to function properly in the long term. Babies start acquiring their personal collection of microbes at birth. But it seems to take a few years for what scientists call our microbiome to fully form. That's where this research comes in. In a paper published Wednesday in the journal Nature, Dr. Sing Sing Way, a specialist in infectious disease in babies, and his colleagues at the Cincinnati Children's Hospital report that the immune systems of newborns are actively suppressed. The experiments, which were done in a lab with mice and blood samples from human infants' umbilical cords, show that certain red blood cells, known as CD71 cells, rein in the newborn immune system. That could create a welcoming environment for beneficial microbes, the researchers say, in a way that an adult immune system can't. Unfortunately, the scientists didn't look at how long immune system suppression might last in actual babies. But most parents know that eventually their child won't get sick as often. And that could be when the immune system strikes a balance between allowing good microbes to thrive while fighting off the bad ones.